When the beluga whale first showed up in the Thames it was hoped it would soon return to the Arctic for its own safety. Two months later, it still appears to be surviving happily on the marine life in the murky water off Gravesend. And now many in the town are desperate for it to stay. “It would be lovely if he sticks around,” said Liz Brown, landlady of the Ship and Lobster on the waterfront. “It’s been really good for business.”The pub is cashing in on those keen to get a glimpse of Benny the Beluga, as the whale is now known. “Usually trade drops right off in November, but this year there’s been a steady flow of people to-ing and fro-ing because of the whale,” Brown said. The pub commissioned a local brewery to make a “whale pale ale” called “Benny’s Beer”, which Brown said whale watchers were lapping up. Paul Paige, a semi-retired waterman who has been drinking in the pub for 30 years, hasn’t tried it. “I’m a lager lout,” he said pointing to his pint. Gravesham council is optimistic that continued sightings of the whale will prompt a beluga bounce in trade. The council even cancelled the annual firework display on the river for fear of distressing the whale. Like many towns across the UK, Gravesend is struggling economically. Despite a new fast rail link to central London the number of shoppers on the high street is falling. It lost a Marks & Spencer store in 2014 and there are doubts over the future of the local Primark. But in the town’s heritage quarter they have been doing a roaring trade in beluga merchandise, including prints based on vintage railway posters. Graham Broadbent, who runs Marie’s tea room and a gift shop next door, has sold out of whale fridge magnets and Benny Christmas cards. “He is bringing in tourists. A lot of them say they have only come here to spot Benny. People were moaning about the fireworks getting cancelled but he’s doing us a big favour,” Broadbent said. There was no sign of the whale or any whale watchers on the day the Guardian visited. Gaynor Oxley, who runs the promenade cafe, claimed to have seen it the previous day and was beginning to get blase about the beluga. “You only see the back of him – it’s a bit boring really,” she said. Martin Garside, from the Port of London Authority, has been monitoring the whale since it was first sighted on 25 September. The PLA’s control room overlooks the whale’s favoured hunting ground on an inner channel of the Thames dotted with barges and buoys. “We have a notice to mariners not to enter this area,” he said pointing to a screen that maps the same stretch visible out of the window. Garside was on watch in 2006 when a northern bottlenose whale lost its way and headed up the Thames. It died of starvation and stranded in Battersea. Its skeleton is in a glass case in the Natural History Museum. 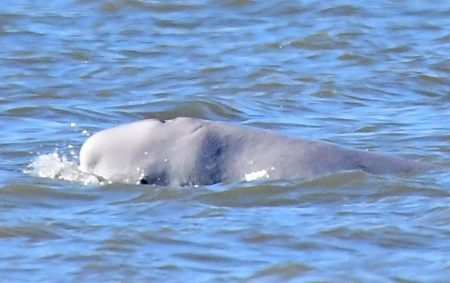 Whale experts have advised Garside that the beluga has much better prospects here as the species tends to favour estuaries, albeit those thousands of miles north of Gravesend. “The view is that if any species of whale can survive here it this one,” he said. “There is a background fear that this is going to end badly, but he’s been here for two months and there are two low tides every day and he’s never stranded. He dismissed reports of a planned rescue as “completely untrue”, adding “we would only intervene if it got stranded”. The PLA is keen to avoid a repeat of the botched attempt to rescue a beluga whale that swam up the Rhine in 1966. Courtesy to the Guardian online. Obviously we’re honoured to have this magnificent animal in the Thames near us but I hope it makes it’s way back to its proper home soon. Can’t help but think it’s presence should be a warning though. Something is going very wrong in our oceans and I’m pretty sure the culprits are us and how we abuse it. For it’s own sake and not our commercial gain, we should saying thanks for dropping by but it’s time to go. Concern over four missing Hen Harriers To feed or not to feed, that is the question.